Get tough on algae with Ecological Laboratories' Mean Green Algae Team two-step program, comprised of our MICROBE-LIFT/PL"the #1 selling bacterial pond additive on the market"with GreenClean®, an EPA Registered granular algaecide! 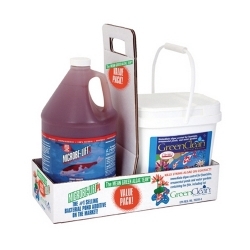 GreenClean is great for killing the algae. Apply it and watch most filamentous or string algae die before your eyes! Three days after its usage, apply MICROBE-LIFT/PL to make the dead algae completely disappear by degrading it to carbon dioxide and water! In addition, MICROBE-LIFT/PL will seed your filter; help break down other organic sediments on the bottom of your pond; keep the water crystal clear; and help establish and maintain efficient nitrification. GreenClean can cause an increase in salinity or rise in pH, so be sure to test your pond water especially if you have ammonia levels above 0.8 mg. L.
Landscapers & Pond Professionals please see below for the Professional Mean Green Algae Team designed especially for you.